Iliana De La Cruz is curious about the world. For as long as she can remember, De La Cruz has wondered about how and why things work. When she came to St. Mary’s University as a freshman, De La Cruz wasn’t sure how to focus that curiosity. However, after talking it over with a few of her professors, she declared two majors — Mathematics and Physics — and went to work finding the answers she was looking for. From there, De La Cruz flourished. 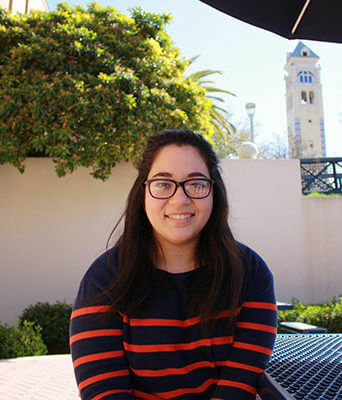 The junior double-major has since taken her wonder about the world from her native San Antonio to several professional conferences, including in California and Washington, where she has presented research. Last year at the Mathematical Association of America’s annual meeting in Austin, De La Cruz took home an award for the Best Talk. Some of her research has included testing DNA mutations in cancer patients and analyzing data on quantum dots, which have been most notably used to improve screens in phones, tablets, TVs and laptops. De La Cruz lights up when talking about her experiences at conferences. While at St. Mary’s, De La Cruz has maintained a 4.0 GPA. There’s no “special recipe” to her success, she said. While De La Cruz says a prayer before each exam, she said her achievements have boiled down to her dedication to hard work. That’s why when Fiesta of Physics come around — a twice-a-year event organized by the Department of Physics and Environment Science for surrounding elementary school children to partake in fun science demonstrations — De La Cruz is overjoyed. The outreach to younger generations is her chance to do what she does best: spread wonder about the world. De La Cruz said no matter where she ends up, she wants to be a good steward of her education. “St. Mary’s has taught me that it’s OK if I don’t know exactly what I’m going to do, so long as I’m helping people and giving back to the community,” she said.